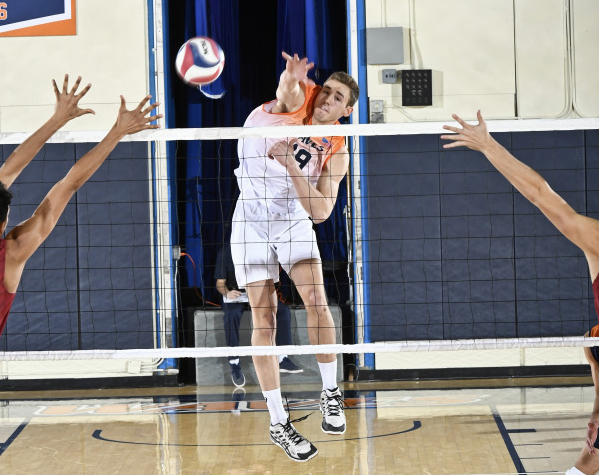 Pepperdine All-American outside attacker David Wieczorek served his way to a college men’s volleyball national award this offseason. Wieczorek was selected on Saturday as the 2018 Off the Block National Player of the Offseason after winning the Best Server award at the Pan American Cup in the summer. The National Player of the Offseason recognizes the best individual performances from current NCAA Division I-II men’s volleyball players during the offseason at international tournaments and beach volleyball events. In addition, fans from around the world determine the winner of this award through online voting on the Off the Block website. Almost 3,000 votes were cast for the National Player of the Offseason with Wieczorek receiving 47.6 percent of the total vote. Wieczorek finished the Pan American Cup with a tournament-high nine aces. The senior outside attacker opened the tournament leading the United States with four aces in a victory against Peru and then had a match-high four aces in a sweep against the Dominican Republic. Despite the serving performance from Wieczorek, the United States finished the Pan American Cup in seventh place. Wieczorek was one of 10 finalists named for the National Player of the Offseason. NJIT opposite Alvaro Gimeno finished as the runner-up with 22.5 percent of the vote. Gimeno in the offseason had a tournament-best 4.45 kills per game average during the third round of the CEV U20 European Championship as he led the Spanish Men’s Junior National Team within one match of the final round. Gimeno and Wieczorek were the only finalists to garner more than 10 percent of the vote. This is the second year of the National Player of the Offseason, and it is the only offseason award presented in college men’s volleyball. Off the Block is a national award winning college men’s volleyball website that launched in 2011 and is the nation’s leader in college men’s volleyball coverage. The media organization presents a variety of college men’s volleyball national awards throughout the year.